You duped me, O Lord, and I let myself be duped; you were too strong for me, and you triumphed. While reflecting on this passage from Jeremiah, I looked up the meaning of the word “duped.” According to Dictionary.com, it means “to be tricked or deceived.” That doesn't sound very good, does it? None of us likes to be tricked, and the idea that God “tricks” us is certainly an unpleasant one. Jeremiah was a reluctant prophet. Like many before and after him, when God called, he tried to politely say “No, thank you.” God persisted and Jeremiah relented. His job was to preach of the captivity of Jerusalem. He was a prophet of doom and gloom and no one wanted to hear about it. As a result, he was rejected by everyone and ultimately branded a traitor. As a result, here in Chapter 20 we find him lamenting. His laments actually lead him to curse the very day he was born (Jer. 20:14). Obviously, this was not the life he would have chosen. Are there times in your own life when you feel God has duped you? Perhaps God has asked you to do something you just don't want to do. It need not be a big thing. It could be befriending the person everyone else has rejected. It could be teaching religious education or volunteering in your child's school. Maybe God is asking you to change careers or be more generous or reach out to that neighbor who you have never really gotten along with. Perhaps, like Jeremiah, you have tried to politely decline the invitation. Maybe you have even looked around to see if there was someone else more suitable to the task. “Surely, God, you aren't talking to me? You must be looking for Amy three houses down!” Never-the-less, God persisted and you ended up doing what He wanted. It would be wonderful if we did God's will and life turned out great for us. Sometimes it does. Responding to a call can bring greater personal fulfillment, an important new friendship, or open doors that we never even knew existed. Sometimes, however, it can leave us feeling like Jeremiah. We may become outcasts for standing up for what we know is right. The person to whom we extended our hand in friendship may reject us. The career change may leave us underpaid and unappreciated. Like the prophet, we may feel that God tricked us, and that even worse, we allowed it to happen. We may be kicking ourselves for following the call, for not being strong enough to resist the power of God. We may even come to rue our very existence. Yet, what is the alternative? If we reject God's call, where does that leave us? We do have choices. God will respect our free will, although He definitely will keep pushing us in the way we are meant to go. We might look at the road not taken and feel that it is better, easier, more smooth. For us, however, that was not the road we were meant to take. It may be smoother, but it is not the road that leads to our salvation. It is not the road that allows us to live as God intended us to live. Yes, it may seem that God has triumphed and in the process caused us to fail, but only God knows the final outcome which may be greater than we could ever imagine. Richard McCarthy wrote an article in my local newspaper this week talking about his "Second-Best" day. Basically, he started out with all these great plans for his day, none of which materialized. In fact, by all accounts, his day was awful. His car broke down, he drove over his own bike, and hurt his knee. He ended up sitting on a set of concrete steps against an iron railing, reading a book, and waiting for a friend to meet him for dinner. The strange thing was, sitting in that unlikely setting, he actually ended up enjoying himself a great deal! He appreciated what had come to him, even though it was far from what he had planned. He ended up having a "Second-Best" day. Life is full of times that don't turn out quite as we planned, but if we look, there is usually some enjoyment to be found in the most unexpected surroundings. "Grace to you and peace from God [our] Father and the Lord Jesus Christ." These words from yesterday's 1st reading are also the words that the priest uses to begin every Catholic mass. It is one of those sayings that we hear so frequently that we don't stop to think about it. While most of us have a pretty good understanding of what it means to have peace in our lives, what does it mean for us to have grace? Grace is a gift from God that allows us to live out the Christian life. When we hear these words, perhaps we can be reminded of the fact that God readily pours out all the help we need to get through our daily trials and tribulations. We simply need to be open to receive it. My mother was recently clearing out her collection of books. She passed on to me a few that she thought I might find interesting. Among them was Understanding marriage, (Deus books) by Charles and Audrey Riker. Published in 1963, this was apparently a book my mom read when she was preparing for her own marriage. My first impression was that this would be interesting only from a historical perspective. After all, marriage and the roles of men and women have changed a great deal in the last 45 years. After reading “Understanding Marriage,” however, I was forced to admit that marriage hasn't changed as much as I thought it had. There are always some basic bones of contention: in-laws, money, division of household chores, how to raise the children, etc. There is always going to be some conflict whenever two people are attempting to share a life together. Many of these “everyday” conflicts can be dealt with using respectful communication and compromise. These types of conflicts wear on a marriage, but don't usually break it. Unfortunately, there will be times during a marriage when bigger crises will arise and the very foundation of a marriage is tested. Some of these crises will be truly sad events such as the death of parents, a child's serious illness, or the sudden loss of a job. Other crises can occur as a result of happier changes, such as adjusting to marriage during the first year, the birth of a child, or a relocation to a different part of the country. Any major change can cause a marriage to falter. Some couples are able to recover from crises better than others, to come out of the situation better and stronger for the experience. What steps can couples take when life is going well to help crisis-proof a marriage? First, cultivate a strong faith in God. In a sacramental marriage, three are involved – the husband, the wife, and God. Prayer is essential to the success of a marriage. Trust that God will provide the strength needed for the marriage to survive the hardships that will come its way. Second, practice with the small issues. As the Rikers rightfully state, “Success breeds success. Failure breeds failure. . . Favorable early experiences lead to co-operation and love. The couple begins to realize their strength as a unit and to face the occasional hazards of their life together.” The more times a couple successfully resolves a disagreement or learns to support each other as a team, the stronger their bond will be and the more likely they will be able to handle the more difficult situations that come along. They will know that even though life might be horrible at the moment, together they can get through it. Third, cultivate each spouse's sense of worth. Husbands and wives come into marriage with all sorts of emotional baggage from their lives. While some have had happier childhoods than others, no one gets to adulthood completely unscathed. Spouses need to treat each other like capable, intelligent people and encourage each other's strengths. Each spouse has some strengths he or she brings to the marriage. Together, the two are stronger than one. Work on building each other up instead of focusing on each other's faults. Fourth, be willing to seek and accept help when needed. It is so easy to get caught in the trap of thinking to have a successful marriage, the couple needs to do it all alone. There are times in life when couples really need to lean on the wider community to get through a difficult time. They may need the help of family or friends or doctors or counselors or spiritual directors. There is absolutely no shame in asking for help or accepting help when it is offered. A village may be needed to raise a child. It is sometimes also needed to support a marriage. Crises will occur in every marriage, but as “Understanding Marriage” points out, “Couples can overcome the hazards of life and marriage, no matter the seriousness, if they continually work to keep their relationship healthy and growing and allow the grace of the sacrament to provide supernatural help. . . A rapid succession of unexpected crises can lead to temporary breakdown in any family. A program of prevention is like money in the bank: it maintains equilibrium even when temporary hazards threaten permanent chaos.” That was good advice in the 1960s and is still good advice today. I am a member of the Catholic Writer's Guild. As a member of that group, my eyes have been opened to the value of Catholic fiction. I've always enjoyed novels by and about Catholics because I feel like I can relate to the characters, but I had never really considered the challenges of getting Catholic fiction published, or the fact that unlike Christian fiction, it doesn't have its own shelf at the local Barnes and Noble. The September 2008 issue of US Catholic features Ann Patchett, a Catholic novelist who falls squarely in that genre of "Catholic Fiction." In the interview, she talks about how her Catholic faith has informed her writing. Her two most recent books are the best-seller Bel Canto (P.S.) which has been translated into 30 languages and has sold more than 1 million copies, and her newest book Run , a suspense novel that takes place all on one day. What about socialization? That is the question asked of every homeschooler. It may even be the reason some would-be homeschoolers decide to send their children to school. How will your children learn to function in society if they don't go to school? 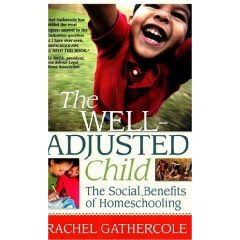 Rachel Gathercole offers a definitive answer to that question in The Well-Adjusted Child: The Social Benefits of Homeschooling . The answer is that homeschooled children not only learn to function in society, but they may actually learn to do it better. Gathercole delves into what it actually means to be “socialized” and offers a historical take on how society managed to function for thousands of years before the start of compulsory education. She counters the idea that homeschooled children are friendless loners, emphasizing that homeschooled children take part in many of the same extra-curricular activities that school children do, such as sports, dance classes, scouts, religious programs, etc, as well as homeschooling group activities. She uses the testimony of both homeschooled children and their parents to bolster her research. While some may be willing to admit that it is possible, after all, for children to have friends outside of school, Gathercole pushes the argument one step farther. She maintains that homeschooling provides a better environment for children to grow up and learn how to be part of the adult world. Unlike children who spend the majority of their lives in a classroom with many other children the same age and one or two adult figures, homeschooled children live in the “real world.” They interact with both children of different ages and adults on a daily basis. They are involved in the daily role of running a house and perhaps a family business. They have the opportunity to get real world work experience (whether paid or volunteer) at a younger age because they have more time. They also have more time to simply be a kid. They have the time to daydream and play and figure out what they are good at. Homeschooled children also tend to have stronger family relationships. With that secure footing, they are better able to spread their wings and step out into the world as adults. “The Well-Adjusted Child” is a must-read for anyone considering homeschooling. It can help alleviate the fear that comes from stepping off the usual schooling path. It is also a great resource for those interested in education in general because it forces one to consider what the true goal of education is and what it really means to be a functioning and productive member of society. I love to look through the catalogs of religious items and books that come my way. 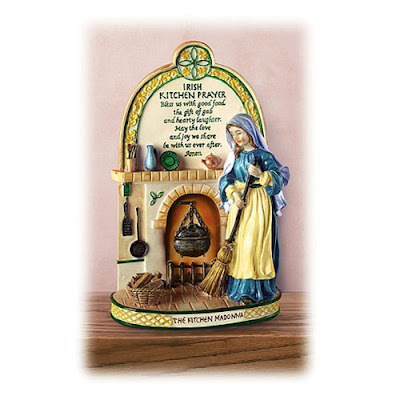 Of course, I can't afford all the things that I would like, but a girl can dream :) I have always been attracted to "The Kitchen Madonna" which shows Mary having a typical day taking care of the house. Honestly, the first time I saw this image, I thought that it was St. Martha who has traditionally been connected to housework. I was surprised and pleased to find out it was actually Mary. I love the humanity inherent in the image - the down-to-earth picture of Mary as housekeeper. That's a Mary all of us who take care of homes can relate to! Just for fun, I looked to see if "The Kitchen Madonna" was available through Amazon. Sure enough, it is, in the event any of you would like to bring this inspiring image into your own homes. For Writers: "Surviving the Spite"
Any writer who puts his or her writing into the public forum is subject to criticism - some of it constructive - other times it is downright mean. For us sensitive types, it is hard not to take it personally. Writer's Digest has a great article onSurviving the Spite. Even if you are not a writer, but work in any field where you are subject to criticism for what you do and how you do it, this article is worth checking out. Thank you to reader Jules Kimberelli for sharing this article with me. It sounds like this is something many women suffer from! Is it Possible to Care Too Much? Our need to feel loved and cared for and to give love and care to others seems to be an innate human quality programmed into our DNA. Feeling loved and cared for gives us a feeling of security and self-worth. Caring for someone else gives us a sense of wholeness — it’s an extension of our love. As good as it feels to care for someone or something, for many people it can also become a source of stress and emotional chaos that leaves them feeling mentally and emotionally drained. Which arises the question, is it possible to care too much? In most dictionaries the first definition of care is a burdened state of mind; worry; concern. It takes several lines before some dictionaries get around to defining care as “to feel love for, to look after, provide for, attend to.” Many people feel that if they're not worrying or obsessing over things it must mean that they’re not caring enough. This need to worry or obsess is an "emotional habit" that operates under the seemingly healthy guise of attention, sentiment and sympathy toward people or situations, but often can end up causing disharmony, depression and a spiral of destructive stress. The term “overcare” was coined by Doc Childre, founder of the HeartMath® system and co-author of numerous books, including Transforming Stress, Transforming Anxiety, Transforming Anger, and Transforming Depression. Doc describes overcare as that which happens when the mind and emotions cross the line of balanced care and get too attached to and bogged down with whomever or whatever you’re caring about. Once you become too entangled in another's web and realize your energy is drained from overcare and over-attachment, it’s easy to be seduced into blaming and resenting the people or issues you care about. * A mother who equates love with constant worry and fret about her children. * A citizen concerned about those affected by a natural disaster becomes inflamed and judgmental towards government or public agencies’ actions. * A spouse who wants to reassure their partner that they love them ends up stifling their partner with attention. * An employee fearful of possible layoffs feeds his anxiety with constant negative projections and assumptions about the future. * A son’s concern for his elderly father leads to continuous arguments with his siblings about how to best care for their father. In all of these examples, what starts out as a genuine and balanced intention to care gets muddled with over-attachment and over-identity and leads to overcare for the person or situation. The original caring intentions instead become emotionally draining to all parties and often can create a negative effect. * The mother's children feel suffocated and distance themselves from her. * The concerned citizen drains personal energy by harboring these judgments, and her resentment toward the system prevents her from taking a proactive approach to helping the people affected. * The smothered spouse craves personal space and the couple separates or even divorces. * The employee’s constant anxiety prevents him from sleeping and jacks up his blood pressure, while his assumptions fuel rumors among colleagues, creating a toxic environment of angst and stress. * The family’s arguments put even more strain on them, making it more difficult to come to a family consensus, and causes the father to feel that he has become a burden. Examples like these are all too common and happen more than we realize. It’s not that we care too much, but more that we don’t know how to manage our care. We think that somehow if we anguish over something enough we’ll get a creative solution or we’ll somehow conjure up the productive motivation we need to take action and resolve something. Worry and anxiety do not solve problems. It is when we finally release the worry, decide to sleep on it, or talk with a friend who helps us let the worry go that the answers finally come to us. As we learn to recognize when we’re starting to get over-identified, over-attached, over-expectant or overzealous, we become more sensitive to our own inner signals. This sensitivity allows us to make internal adjustments and get back to that balanced place inside where the original care started. * In what areas is care adding to your energy and reducing your stress? Why? * In what areas is care draining your energy and giving you stress? What do you overcare about in the situation? * Are you over-identified with someone or some issue? * Are you over-attached to a particular outcome? * Which of the common masks of overcare – sentiment, attachment, expectation, or sympathy – best describe what you experience? In their book Transforming Anxiety, Deborah Rozman and Doc Childre provide tools and techniques that will show you how to release the anxiety and worry associated with emotional habits like overcare. Letting go of the overcare will give you the inner security and strength you need to get back to the balanced care where you can tap into your creativity and passion. The following tools from HeartMath are designed to help ease out any stressful emotions and the emotional drain that result from overcare. In order to shift out of overcare you first need to identify what you’re feeling. By slowing down the emotional energy running through your system, you’re better able to identify whether it’s worry, anxiety, hurt, etc. 1. Notice and admit what you’re feeling. 2. Try to name the feeling. 3. Tell yourself to e-a-s-e – as you gently focus your attention in the area of your heart, relax as you breathe, and e-a-s-e the stress out. Attitude Breathing is a tool to help you shift out of an emotional draining state and back to a balance state of care. By practicing this you will learn to clear and replace the overcare with a more balance and positive emotion and gain a more intelligent perspective. 1. Recognize an unwanted attitude: a feeling or attitude that you want to change. This could be overcare, anxiety, self-judgment, guilt, anger, anything. 2. Identify and breathe a replacement attitude: Select a positive attitude, then breathe the feeling of that new attitude slowly and casually through your heart area. Do this for a while to anchor the new feeling. Based on 17 years of research, HeartMath has also developed unique technologies that give you objective feedback by measuring your heart rhythms. Using tools such as the Notice and Ease and Attitude Breathing in conjunction with the emWave Personal Stress Reliever® or the emWave® PC Stress Relief System will give you the added benefit of real-time feedback - helping to quickly guide you back to a balanced mental and emotional state. * HeartMath offers a number of free resources that can help you release the stress and anxiety of overcare and get back to a balanced care. * Stress Survey: a free survey tool designed to help you understand how various aspects of your life impact your levels of stress and well-being. * Personal Tracker: a free web application to track five important aspects of well-being. * Webinar downloads on topics like transforming stress and anxiety. * Register for upcoming webinars on various topics related to mental and emotional well-being. Copyright © 2008 HeartMath. Since 1991 HeartMath has been dedicated to decoding the underlying mechanics of stress. HeartMath is internationally recognized for their solutions to transform the stress of change and uncertainty, and bring coherence and renewed energy into people’s lives. Research and clinical studies conducted by HeartMath have examined emotional physiology, heart-brain interactions, and the physiology of learning and performance. Through their research they have demonstrated the critical link between emotions, heart function, and cognitive performance. HeartMath’s work has been published in numerous peer-reviewed journals such as American Journal of Cardiology, Stress Medicine, and Preventive Cardiology, as well as business journals such as Harvard Business Review and Leadership Excellence. HeartMath’s organizational clients include Mayo Health System, NASA, BP, Duke University Health System, Stanford Business School, Redken, Kaiser Permanente, Boeing, and Cisco Systems, as well as dozens of school systems and thousands of health professionals around the world. To learn more about HeartMath, go to http://www.heartmath.com. If there is a college freshman (or first-year student as they are sometimes referred to) in your life, you might want to give them a copy of Busted Halo's ,Freshman Survival Guide/ It's short, to the point, and full of valuable information. Lately I have been readingWomen's Day Magazine. It is one of those magazines my mom used to buy on occasion when I was young - usually an impulse buy at the grocery store check-out. I have to admit, I hadn't really thought of it much since. But, after reading it the past few weeks, I'm really very impressed. It provides a lot of practical information that comes in handy in running a household. If you have a Bank of America credit card, You can get into select museums for free the first weekend of the month. Visit bankofamerica.com/museums to find museums in your state that participate. Looking for some place to sell those books that are taking up space in your house, check out Cash4books.net. Put in the ISBN for your books and they will let you know how much they will give you for them. They even pay the shipping! If you are serious about saving money on your groceries, you might want to check outthegrocerygame.com. There is a small fee to participate, but it may be worth it to save more. On the "Behold Your Mother" blog right now, they are featuring a group of wonderful books about Mary: http://beholdyourmotherbook.blogspot.com/2008/08/mary-moments-book-edition.html. I'm honored that my book, Letters to Mary from a Young Mother was included among them. This week's gospel (Matthew 15: 21-28) tells the story of the Canaanite woman who begged Jesus to heal her daughter. The Canaanite woman was a Gentile, a non-Jew. Jesus treats her downright coldly at first. As she pleads her case, Jesus ignores her. The disciples ask Jesus to do want she wants because she is aggravating them, following them around. He counters that he “was sent only to the lost sheep of the House of Israel” and tells the woman herself that “it is not fair to take the children's food and throw it to little dogs.” She replies, “Yes, Lord; but even little dogs eat the scraps that fall from their masters' table.” It is only then that Jesus responds with kindness and heals her daughter. It is important to note that this passage comes from Matthew's gospel, which was written for Jews. The point of the story is to show that the Gentiles were eager to accept Jesus as Lord even though the Jews were reluctant to do so. It also illustrates the importance of faith. No matter what Jesus said to her, she kept believing that he could heal her daughter. As a mother, this story carries further meaning. The Canaanite woman is a mother who will do whatever she needs to do for her child. Her daughter is “tormented by a devil.” At that time, devils were blamed for both physical and mental illness, but with that word “tormented,” one gets the sense that this is most likely a mental affliction. Here is a daughter who is suffering, and most likely has been suffering for quite some time. There is no worse pain than watching your child suffer and not being able to do anything about it. She had heard of Jesus, perhaps even witnessed him heal someone. This is her last hope, and she is going to pursue it until she gets what she wants. She is willing to even verbally spar with Jesus. She doesn't shrink away when Jesus questions her right to be there. She just keeps pushing. Every mother has to advocate for her child at some point, and it is not always easy. It can be hard to stand up to teachers, or principals, or doctors in order to make sure that a child gets what he or she needs. It can be hard to speak up, but it is part of a mother's job. I am a naturally very introverted person. I hate conflict and don't do a very good job of sticking up for myself. After my first child was born, however, I soon learned that I had to stick up for him because no one else would. I had to speak for him because he couldn't speak for himself. When he was diagnosed with life-threatening food allergies, I had to tell people. I had to make sure that accommodations were made for him whenever he was going to be someplace without me. When he started school, I had to make sure that he would be safe. I had to teach his teachers and the cafeteria workers how to use his epi-pen. I had to make sure that his classroom would be peanut-free. I had to do the same if he went to a friend's house or to a party. I have had to advocate for my younger son for other reasons. It just comes with the parenting territory. Mothers can be inspired by the Canaanite woman. I don't think that I would have the courage to stand up to Jesus the way that she did. After he ignored me, I probably would have slunk away. The Canaanite woman reminds me, and all mothers, to stand firm, to continue to have faith and advocate for our children. Whether we are on our knees praying, or in the principal's office discussing school policy, we are our child's voice when they cannot speak for themselves. When we start to lose faith in our ability to be that voice, we can remember the Canaanite woman and emulate her courage and strength. Many thanks to Brian Patrick and Matt Swain for inviting me to be on their Son Rise Morning Show on Sacred Heart Radio out of Cincinnati this morning. It was a great pleasure to have the opportunity to tell more people about the beatification of St. Therese's parents, Louis and Zelie Martin. Most people would look at Teresa Tomeo - author, host of an internationally syndicated talk show, and noted speaker - and make the assumption that this rising star never had a day of trouble in her life, that she's one of those lucky ones for whom the stars just seem to align perfectly. Perhaps her willingness to share the true portrait of her life and to smudge the perfect picture a bit is what makes her newest book Newsflash: My Surprising Journey from Secular Anchor to Media Evangelist so incredibly compelling. I have to admit to being in the camp of people who looked at Teresa's rising success and faith-filled attitude without knowing the full truth behind her journey. Newsflash: My Surprising Journey from Secular Anchor to Media Evangelist is Teresa Tomeo's first person account of the events in her life that have brought her to her current role as a woman on a mission to employ the power of the media to bring people to the fullness of the truth of a life lived with God at one's center. With surprising candor, Tomeo recounts her rise to the heights of the network news business and her subsequent sinking to the depths of the industry, including a trip to the unemployment line. When we think enviously of television personalities who live their lives as open books, rarely do we pause to contemplate the pain they must face when their own personal tragedies are played out in the public eye. Teresa Tomeo, however, was able to take what most would consider a deal-breaking hand and turn it into a winner. Newsflash: My Surprising Journey from Secular Anchor to Media Evangelist chronicles Tomeo's career, but more importantly the spiritual path that led her from a fallen-away Catholic on the brink of divorce to someone who currently inspires millions on a daily basis worldwide via her satellite radio podium and acclaimed writings. Using the themes of the news business to orient itself, this book is part biography, part spiritual outreach. Teresa doesn't sugar coat any part of her life, even putting such difficulties as marital discord and an eating disorder under the microscope so others can learn and be inspired by her journey. In doing so, shares with the reader a message of great hope and inspiration. If we are willing to submit direction of our life to a loving God and place him at the "master control" of our world, we can have the same sense of hope, peace, and confidence in salvation that permeates Teresa's life today. Teresa's story of going from laid off news anchor to one willing to accept a new assignment according to God's design ultimately brought her a great sense of clarity and devotion. Her willingness to embrace the mantra "Let my misery be my ministry" gave her the marching orders she needed to reach out and to touch the lives of others. And now, she is on fire to share the "scoop" - the good news that our lives can be as filled with purpose, meaning and happiness as her own. My goal with this book is to give witness to the mighty works of God in my life. I want to give glory and honor to Him in all that I say and do. I also think of the many women I have met throughout my career who have fallen away from the Church. These women are in my heart as I write this book because I want to take their hand and walk them home to Rome. And, of course, I write this book so that all can be reminded of the graces and mercy of God. With wit, zeal, compassion and "can't put it down" readability, Newsflash: My Surprising Journey from Secular Anchor to Media Evangelist is a true treasure. The book is firmly based in solid doctrine and contains numerous references from scripture, the Catechism of the Catholic Church, and papal encyclicals. Newsflash! is endorsed by Monsignor Mangan, of the Vatican; Al Kresta, CEO of Ave Maria radio; Doug Keck, Host of televison's"Bookmark;" best-selling Catholic authors Donna Maria Cooper O'Boyle and Steve Ray; Catholic editor and author Heidi Hess Saxton and more. Complimenting the main portion of the book is a wonderful section with personal reflections and helpful resources at the conclusion. Take my advice and buy two copies of this book - one for yourself and one for a friend with whom you'd like to share the fullness and beauty of the Catholic Church. You'll both be better off for having heard Teresa Tomeo's Newsflash. For more information on Newsflash: My Surprising Journey from Secular Anchor to Media Evangelist visit http://www.teresatomeo.com. Orders placed before September 1, 2008 will receive free shipping and handling. Visit her at http://www.lisahendey.com for additional information. I had to marvel at the beauty of it all. I had to wonder at the beauty of it all. What Artist could fashion such a striking scene? What brushstrokes has there ever been? What landscape of colors have eyes ever seen? Arrayed in a setting of the most graceful green. I'm simply amazed by the beauty of it all. "The Beauty of it All" © August 12, 2008, Copyright. All Rights Reserved. Carmel Michael Rizzo, ChurchMouse.Bz ®, Songwriters Association of Canada. Carmel Michael Rizzo has a Bachelor of Arts Degree (4-Year, Honors, "Christianity and Culture," St. Michael's College, University of Toronto), a Bachelor of Education Degree (Honors -- Elementary to Adult ESL Education, University of Toronto), and a Creative Advertising Diploma (Three-Year Diploma, Centennial College of Applied Arts and Technology, Toronto, Canada). Mr. Rizzo is a High-School Religion Teacher with the Toronto Catholic District School Board (TCDSB), Canada. His specialties include Catholic Song Lyric Writing, Marian Devotion and Advertising Copywriting. He is the Writer/Co-Producer of the "Top-Selling," Pro-Life Video: "Rescue with Joan Andrews" (1988). Web Sites: True Devotion to Mary; Catholic Sacred Music; St. Aidan's Church; Email: Charles@ChurchMouse.Bz. St. Therese of Lisieux wrote of her parents, “God gave me a father and mother more worthy of Heaven than of earth.” Over a century later, the Catholic Church will officially confirm what St. Therese already knew. On July 11, 2008, it was announced that Louis and Zelie (Guerin) Martin would be beatified on Mission Sunday, October 19, 2008. They will become the first married couple to be beatified in the history of the Church. As such, they are saintly role models for married couples and parents. At age 22, Louis Martin (1823 – 1894) attempted to enter religious life at the monastery of the Great St. Bernard Hospice in the Alps. Unfortunately, he was unable to master the Latin that was required. As a result, he sadly gave up his dream of becoming a monk. Instead, he became a successful watchmaker and would later manage his wife's lacemaking business. Zelie Guerin (1831 – 1877) also dreamed of religious life, but she was unsuccessful as well. She turned her attention to mastering the art of lace-making which her hometown of Alencon, France, was known for. She soon started her own business and became quite successful in her own right. Louis and Zelie married on July 13, 1858 when Louis was 34 and Zelie was 26. By mutual agreement, they lived their first ten months of married life without consummating their relationship. Due to the spiritual direction of a confessor, they began to try to have children. Their efforts were rewarded. During the next fifteen, years, they would have nine children, although God would call four of those children back home to Him when they were very young. Despite her grief, Zelie always held onto her faith that she would see her children once again in heaven. Zelie and Louis prayed that all of their children would be consecrated to God. Zelie would die young from breast cancer, when Therese was only four years old. She would be a dedicated mother to the very end, and all of her children had fond memories of her. She raised them with love and encouraged them to be generous and to make sacrifices for others. Her own life was a model of that self-giving. After Zelie's death, Louis would move the family to Lisieux to be near Zelie's brother Isidore and his wife Celine. He was a devoted, faith-filled father. He would pray frequently with his children and would often take Therese on his daily visits to local Churches to visit the Blessed Sacrament. While he was sad to lose his daughters, he strongly supported their religious vocations, even accompanying Therese to Rome so that she could beg the Pope for permission to enter the Carmelite order at the young age of fifteen. By the time of Therese's Clothing in the Carmelite Habit in January 1889, Louis himself was very ill, but he was able to walk his daughter, dressed in her wedding gown decorated with her mother's lace, down the aisle to become a bride of Christ. Louis would suffer several strokes before his death in 1894. His daughter Celine would care for him until the end. After his death, she, too, entered religious life. Louis and Zelie, who both wanted so desperately to enter religious life, would have all five of their living children live out that dream. This is an excerpt from the Living Faith entry for today. Writing involves courage in sharing from deep within, without any certainty that it will do a bit of good. It involves a lot of waiting without a concrete reason to hope. It strikes me that being a disciple of Jesus is also about that stepping forward and waiting - every day. Holding on tight to the promise that its fulfillment - and our joy - will surely come. I'm watching the opening games of the Olympics right now. This is just one of the most amazing things I have ever seen - the technological achievement and the beauty. I love the Olympics and look forward to them every time they come around. These are the first Olympics that my children will remember and they are all excited as well. We were already watching "Dressage" on NBColympics.com earlier this evening and I am sure they will be watching much more TV than usual over the course of the next two weeks. The Struggle to Be "Supermom"
In the latest issue of Canticle Magazine, Elizabeth York wrote a great article: "Frazzled: The Secret of Homeschool Success." What she wrote about is important for all moms, not just homeschooling ones. We all get tempted to do too much and, in fact, try to do much. In the process, we often try to get our kids to do so much. Somehow, the culture says that if our children are not spending every waking minute in some organized, educational activity that they can list on their college application, they are wasting their childhood. And then this same culture wonders why it is that kids today are so easily bored and can't "think out of the box!" They can't keep themselves entertained because they haven't had the opportunity to do so. How can they develop imaginations when they have never had the time to daydream? There is nothing wrong with an extracurricular activity or two, but when it is stressing out both the child and the mom, the time comes when you as the mom need to draw the line and drop something from the schedule. The same thing holds true for us. It is tempting to take on lots of activities, work, etc. while maintaining our households, but if the stress level becomes unhealthy, it is time to back away from something. It is OK to turn down taking part in something (even if it is a good something) if it brings stress onto your family. It is OK to say "No." While all us try to be the best moms and women we can be, "Supermom" is a myth. We need to accept ourselves as we are and make love, not our resumes, the standard by which we judge ourselves. Every year this happens. In June, it seems like summer will last forever. The days stretch ahead full of promise . . . and then, you turn around and it is August and every one's mind is in gearing up for "back to school" and getting ready for Fall. I kind of want to scream, "Wait! I'm not ready yet!" I want more laid-back days. While it is nice that the weather will be turning a little cooler, I don't want to go back to jackets and hats and mitten weather. Oh, well, it is a losing battle, I suppose, and I do manage to adjust to whatever season we happen to be in. That's the joy of living in a place with four distinct seasons - each one has its plusses and minuses and you can't really get too sick of any one season because before you know it, it is gone. I took inventory of the boys' fall clothes today and gathered up two big bags for Goodwill along with a list of things I need to get for them. For years, Isaac was one size behind David, so David's clothes would just go into Isaac's drawers, but now, courtesy of Isaac's 5 year old growth spurt, they are both the same size. So, now they share the clothes, but the whole hand-me-down thing just doesn't work anymore. We have started to "officially" start school on August 25th. We were going to start on September 2nd, but this way we can be done earlier in June when I am sure they (and I) will be more than ready to be done. We have been doing math and reading all summer. I am so thankful that I don't have to send them to school this year, but I must admit that I am somewhat intimidated by the prospect of getting them into a schedule and doing all the subjects. I can hear the whining now. They both hate writing, which from what I have read, is really pretty common in young boys so I think that will be the biggest battleground. I just really want this to work and go well. I know that there will be miserable days, as there is in parenting in general, but I want the good days to outnumber the bad! I want them to enjoy learning, and mostly, I want them to actually learn so that in June when I look back, I can see that they have made progress. We will have a co-op we will be going to on Mondays and a social outing on Thursdays. Plus soccer will be starting up which with two boys on two different teams makes life a little bit crazy. I really want it to stay the beginning of August - permanently. I know I can't do that, of course, so I will just need to enjoy the time that we do have and hope the next couple of weeks go by slowly. The whole world is theology for us, because the heavens proclaim the glory of God. That is an important thing to remember. My older sister had been living with us for eight months. We spent last weekend moving all of her belongings to her new small home, emphasis on small. While we enjoyed having her living with us, it was good to get all the boxes out of our basement. However, there simply wasn't enough room in her new home for all the items. With much prodding, we actually weeded through some of it and gave a good amount to Goodwill. She did have a small extra bedroom which she was using as a storage area until one of her grown children called her this week and asked if he could move in with her for a while. Guess where the things are going that were in that spare room. Yes, back to my basement. In addition, my husband and I both work from home, which means that we have computers and office supplies and files. My kitchen table is currently piled high with binders of church bulletins I am using as reference materials to write a parish history. I have craft supplies and a collection of paintings that I did years ago. I have no one to give them to, but somehow I can't seem to throw them away. We have books and clothes and sports supplies, and well, you get the idea. I try to weed through regularly and give away what we don't need, but still, there is just so much. I know I'm not alone with this problem. That is why organization and clutter management is such a big business. Am I the only person who finds it strange that we spend good money to buy more stuff to organize the stuff that we already have? Doing that causes me such pain. I recently went to visit an older woman who lives in a senior citizen facility. She has this beautiful little one bedroom apartment which I complimented her on. She said that she used to live in a fifteen room house and that this was the best thing that had ever happened to her! Imagine the downsizing that took place to make that transition! The very next day, I visited a woman in a nursing home. She is in her nineties and has literally a handful of items to her name – a few clothes and photos and that is it. The progression made quite an impression on me – big house with so many material possessions, to small apartment with a manageable number of items, to a nursing home with almost nothing, to death, in which items are not needed at all. Add to this the Christian ideal of living simply and giving all to the poor and I feel at a loss about my relationship to the “stuff.” Giving it all away simply isn't an option at this point, and honestly, I'm not ready for the nursing home level of possessions right now. I know the toys will eventually be outgrown and I accept the clutter as a necessary evil in the parenting experience. I would much rather have the kids and deal with the clutter than not have them and have a spotless house. The work items are also necessary. I am thankful to be able to be work at home and so that clutter must be accepted as well. It is good that I have the room to help my sister out in keeping her possessions, much of which is photos she can't bear to part with. It is definitely true that we don't need all the things that are in our house, and I will continue to wage the battle against the clutter, but in the meantime, the stuff is a sign of a busy, happy household. When I get frustrated with it, I need to remember that this is just a temporary state. Yes, I need to be thankful for the mess! Dear God, please bless my well-lived in messy house.